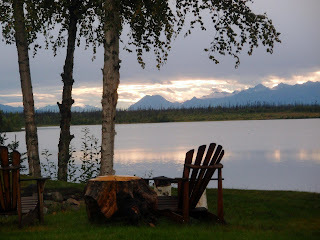 The final two days in Alaska were spent at Gayle’s cabin on Horseshoe Lake. I had some initial concerns at the prospect of using an outdoor, unheated shower, when highs were only expected to reach 60 or so, and no sunshine was forecast. Turns out that concern was misplaced – we just didn’t shower! Unlike being in the south however, we also did not sweat, so never got terribly icky. Still, Sunday afternoon’s return to indoor plumbing and hot showers at Gayle’s house in Anchorage was not unwelcome. Saturday morning we awoke to breathtaking views of the sun peeking through the clouds and covering the mountains in the distance and across the lake. 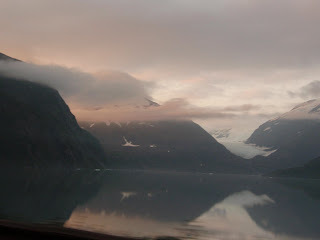 The large windows across the front of the cabin allowed us to literally wake up to this view. I just opened my eyes and there it all was. The lake was as smooth as glass in the morning, so Ryan and I headed out in the kayaks for a tour of the lake. 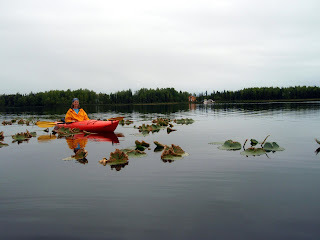 We were escorted on our paddle by loons, diving for breakfast, and cheered along by the sandhill cranes. As we inched through the lily pads, one of the small fish jumping around us almost landed on the front of my boat. 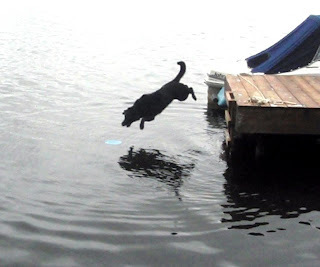 As we arrived back at the dock, we were greeted by Bill, who was busy fiddling on the boat or the float plane, or both – I’m not sure because he was moving so fast. 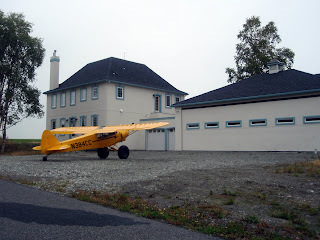 The drive to Horseshoe Lake from Anchorage takes about 1:45, but Bill can just walk out the front of Lake Hood Inn, hop in his plane, and be at the front door of the cabin in about 15 minutes. Gayle was already busy fussing over preparations for yet another festive gathering that evening. Though we all stopped for breakfast of poached eggs, bagels and oatmeal, before hopping in the boat to motor over to visit with Karen and Roger Pfeifer. The Pfeifer’s also have a cabin on Horseshoe Lake, around the horseshoe from Gayle. 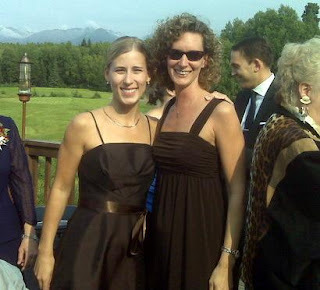 Karen’s son Sloane Unwin was just married two weeks prior and they held the reception at the cabin. The Pfeifer’s cabin was creeping along in early stages of renovation/addition around March, when they learned of the plans to use the cabin for wedding reception. Because they had a 5 week trip to Africa already scheduled for May/June, they were quickly under the gun to finish MUCH earlier than planned. By their account, it wouldn’t have been finished without Gayle and Bill pitching in to ensure electrical, insulation and sheetrock were all completed. Gayle and Bill even continued working after the Pfeifer’s had gone on vacation. Such is the way it is here. Family, friends, neighbors – people here just do. In the week before we arrived, a very good friend of this group, Nancy, was hit by a car while biking to work. Throughout our stay we’ve heard regular updates on her pelvic, hip and back surgeries, from folks who go to the hospital daily to sit with her, and offer some time for her husband, Doug, to get out of the hospital a bit. People here do not stop to question if they have time or can work something into their schedules, or even if they can afford it. When someone here needs help, others simply stop and help. I don’t know if it’s the remoteness of it all, drawing the community in closer, or if it is the general overriding sense of being one with nature, here in this state where you can hardly think of a thing to do that can’t be done within a couple hours drive, but it’s a beautiful sense of humanity that makes you feel like you’re home. The Pfeifer’s also have a dog named Tarmac, a dog well trained to retrieve ducks during hunting season. As you can see, he’ll also dive in head first for a simple Frisbee! Tarmac and his brother Tundra joined us that evening for our dinner cookout, when the Pfeifer’s, as well as Sloan and his new bride Rebecca, came over. Also joining us for the day was Cherie Anderson, Gayle’s sister. Cherie, like Gayle, is an interesting and intriguing lady. Cherie is well educated in essential oils, and was kind enough to bring a special concoction with my name on it. Thanks to the White Verbena, it has all my favorite anti’s: antibacterial, antiseptic, anti-anxiety, and much more! In time for dinner we also had one more guest, Leo von Scheben. Leo was appointed by Palin as the Commissioner of Department of Transportation. 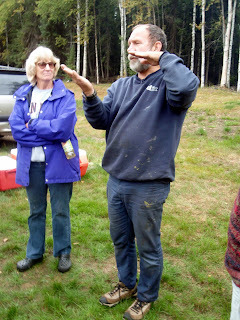 Prior to that he was principle in USKH (Unwin, Scheben, Korynta, Huettl), where Gayle worked for 25 years. Leo has done surveying, industrial engineering, civil engineering, and has an MBA. Leo lives on Horseshoe Lake and has had a very interesting life. I wish I’d had more time to chat with him. One more very interesting life is that of Roger Pfeifer, by whom I was very intrigued. Roger is married to Karen (Unwin) Pfeifer, whose husband Gordon Unwin was also a principle in USKH, but was lost in a helicopter accident 19 years ago. Roger tells it like it is, something I greatly appreciate, even if the story is less than flattering. One story that IS flattering however, is Roger’s 1982 climb to the top of the 20,320 ft Mt. McKinley. I couldn’t get enough information from him about this, and he probably grew tired of my incessant questions (how many people, what did you eat, how long did it take you, did everyone make it, how bad was the weather, etc.). It took his team 38 days (34 up, 4 down), and they lost two team members on the way (they both lived, just didn’t make the peak). In spite of consuming 6,500 – 7,000 calories per day, Roger lost 35 pounds in those 38 days. Roger is some kind of interesting. He made his way to Alaska from Ohio, via the Army, which sent him to Vietnam to fly helicopters. He fell in love with Alaska, like so many have, and never left. You can see the sparkle in Roger’s eye as he starts describing the vast array of activities available at his doorstep. He’s a hop, skip and a jump away from retirement after a couple decades with FedEx, and would love to offer vacation planning for folks traveling to Alaska who aren’t sure how to pack everything Alaska has to offer into their 14 day once-in-a-lifetime visit. He clearly wants everyone to experience the joy he has in this state. We sat around the campfire until late into the night, drinking Alaskan ales and philosophizing about life and pondering the deeper meaning of it all, thanks to Bill who kept posing thought-provoking questions. I’m pretty sure we sketched out the path to world peace that night… if only we hadn’t accidentally dropped the map in the fire. Shoot, I guess we’ll have to do it again. Sunday morning we repeated our breakfast from Saturday. Ryan went kayaking and fishing for trout. He said the fishing was great, the catching – not so much. Gayle and I sat on the end of the dock watching Bill and Ryan do touch-and-go’s in Bill’s plane on the lake. Finally it was time to pack up and head back to Anchorage, where we all headed straight to a hot shower, and Ryan and I began packing up for our return to the lower 48. We left with far more than we brought, including a 42 pound box of Halibut. I left with more than can be measured by a scale – a new understanding and appreciation for The Last Frontier, a lot of sore but happy muscles, almost 1,000 pictures, and the love and joy of more new family members than I could have imagined. My deepest thanks to all the Roth’s, Anderson’s, Pfeifer’s, and all the other family and friends I made in Alaska over the past 10 days. Thanks for the stories, the history, the experiences, for making sure Ryan and I had a wonderful time, but mostly for allowing me to become part of your wonderful family. Day 8 we woke up, packed up and headed north, my first time north of Anchorage. 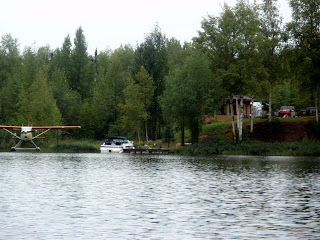 We drove to Talkeetna, Alaska, a quaint little town, which offers flightseers trips around Denali (Mt. McKinley). Some offer glacier landings, where you can fly up, get out and walk around the mountains. For those who don’t know it Denali, meaning The Great One, is the native name for the mountain, and the official Alaskan name for it. In the lower 48 it is widely known as Mt. McKinley, the tallest mountain in North America, at just over 20K feet. We went first to the Talkeetna Lodge, which I hear offers the best views of Denali, hands down. I can’t say for sure because when we were there, just like around 60 – 70% of the time, you couldn’t even see the base for clouds and fog. Denali is so tall, and it shoots up so dramatically, that it generates its own weather patterns. So far this year 1,161 climbers have attempted to reach the summit. Of that number 682 have actually made it. While the forest service didn’t list the next number – Gayle said there have been a couple of fatalities as well. The main climbing season begins in mid-May and goes through the end of July, with the best climbing recommended in June. Even then climbers encounter temps as cold as 40 below on the mountain. The world map on the wall of the forest service building had pins designating the areas from which climbers have come this season, including North and South America, Africa, Europe and Asia, with a larger number being from Europe. The average climb takes between 17 and 21 days, so climbers need to take 4 weeks worth of provisions, not to mention all the gear needed for the varying terrain and sub-zero temps. With so much gear required, climbers often end up making “double carries,” where they carry part of their gear from one level to the next, then return and carry the rest. It sounds to me like they are climbing the mountain twice! Because of the 20K+ foot altitude, climbers can generally climb no more than 1,000 ft per day, to allow their bodies to adjust to the decreasing oxygen levels. It really is an awesome thing just to imagine making a climb of that magnitude. It makes my marathon finish very humbling. 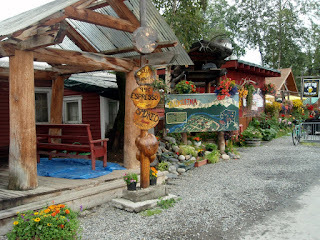 After a quick stop at the Denali Brewing Company, to ensure they were running an upstanding, quality business, we headed south again, turning off just north of Wasilla and heading over to Horseshoe Lake, to meet up with Gayle and Bill at the cabin. While coming up through Wasilla we did drive by the Palin house, but for all my efforts, I could not see Russia. Bummer. Ok, maybe that’s not exactly what she said. So we arrived at the cabin in time for some of Gayle’s vegetable soup which, like everything she touches, was wonderful. The cabin is on a neat piece of lakefront property, that used to be a gravel pit. The gravel was used as the foundation for the nearby VOR navigational aid for aircraft. Speaking of aircraft, it is as common a mode of personal transportation here in Alaska as motorcycles are in the south. 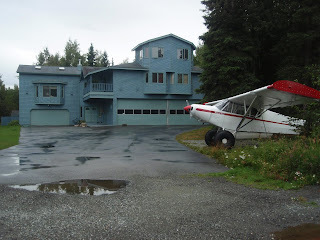 As you can see below, here in Alaska they just park their planes right in their driveways! Gayle has managed to grow a full lawn of grass and lots of flowers and plants on the land, in spite of the early soil limitations (note: I understand lots of horse manure was involved in that effort). The cabin, which she and Bill built themselves, is a 16 x 16 square building, with tons of windows and light, and has an airy feng shui feel about it. She very graciously offered the cabin to me and Ryan, while they took “Lucy,” Bill’s 1957 Silver Avion, which looks very much like an Airstream. So we were able to retire to bed for the night, looking out across the lake at the last bit of light illuminating the mountains across the water, watching the wind softly blow the leaves in the surrounding birch trees and listening to the loons call to each other. Day 7 began with another trip to the Laughing Lotus Yoga studio in Anchorage. What I did not realize is we were going for “hot yoga” (not that I would have known what that meant). In spite of my years of activities and fitness, I’ve never quite gotten into yoga. For those who don’t know, hot yoga is done in a room kept around 105 degrees. Finally, I thought, I have an advantage over these locals. This southern girl is just getting warmed up at that temperature! The instructor made his way to my corner before class began to inquire if I’d ever done hot yoga before. When I told him I’d only done yoga one time in my life, I think he tried to conceal his concern for me. So, thinking it would reassure him I added “but I’ve done Wii Yoga!” He ALMOST managed to refrain from rolling his eyes at me. I hadn’t eaten before-hand, so it was when I heard him later, across the room, telling someone to “always eat before hot yoga” and “if you think you might throw up, leave the room first” that I began to worry. Hot yoga is also called Bikram yoga and it works the entire body. Fortunately, I am a stickler for stretching after exercise and I get regular massage. And (laugh if you will) I really do think the Wii Yoga has helped improve my balance. I managed to hold my own and complete all of the poses, even if they weren’t pretty or graceful (and trust me, they weren’t)! 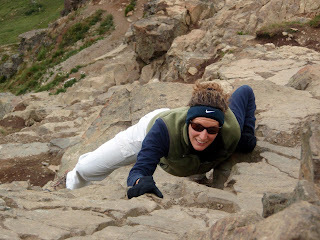 So, off we went to hike Flattop Mountain Trail. 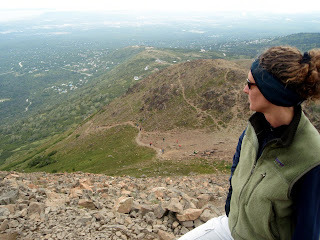 The elevation at Flattop is 3,550 feet, or just under that of Alyeska. Fortunately, to hit the trail you drive up part of the mountain, so that your total climbing elevation is 1,252 feet. Thank goodness too, because these Roth’s are wearing me OUT. The climb proved to be quite challenging. Early on the effort required feels minimal (unless you’ve already been Halibut fishing, mountain climbing and twisted up like a pretzel in the prior 3 days). I was dragging to start, but got my much needed second wind in time to start the vertical ascent to the top. When I say vertical, I mean thank goodness I had a little rock climbing training a couple weeks ago, because I was using both hands and legs. We reached the top of Flattop and literally, as we crested the side of the mountain we were met with winds easily reaching 35 mph or more, and a 20 – 30 degree drop in temperature. It was well worth it though, as we were rewarded by magnificent views of the Cook Inlet and Turnagain Arm, as well as Chugach Mountain Range around us, and Anchorage below us. Here is a shot of Flattop from the parking lot. We climbed our way to the very top of that mountain. And yes, it’s as steep as it appears. Returning to Gayle’s, she and Bill had a full meal of Alaskan King Crab legs, steamed broccoli, cabbage and green salads going. Another fantastic meal in Alaska! Now we are all busy preparing for our weekend trip to the cabin at Horseshoe Lake. I don’t know any more than that, except Ryan and I might be heading to Denali first. But, just like me, you’ll have to stay tuned to find out what happens next! Much to my relief day 6 brought some rest and recovery. After an easy morning Gayle and I headed into town to visit another farmer’s market for some fresh veggies. Then we drove over to the federally funded Alaska native hospital, where they have a magnificent gift shop, full of handmade native Indian crafts. We visited a few other similar shops, where it was fun to see the hand-crafted furs, leathers, knives, spirit masks and related items made by various local tribes. This afternoon Gayle treated me and Ryan to massages at the Laughing Lotus Yoga studio in Anchorage, where Alanna helped work out our sore muscles from fishing and hiking. I understand we’re going back there in the morning for some actual yoga, which should be a great follow up to the massage today. 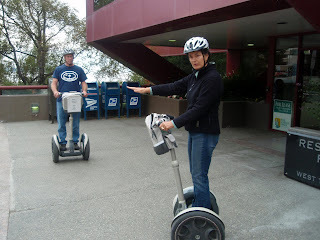 From massage, we headed into downtown Anchorage to meet Gayle and Bill for a Segway tour. Our guide was actually from Baltimore, a school teacher and has been living in Alaska for 6 years or so. On our first stop his local history facts were being corrected. By the second or third stop Gayle was outright in charge of our education of local facts and information. It was fun to hear about her experience during the 9.2 magnitude Good Friday earthquake of 1964, which lasted 5 minutes. No building in Anchorage is older than 1915, which is the year after they completed the Alaska railroad. Bill chimed in with some interesting facts as well, talking about how the salty and fresh waters mix in the inlets, forming large ice chunks in the winter. This is due to the fact that fresh water freezes faster than saltwater, so large chunks of frozen fresh water float around in the salty water. So when the ships come in to dock, they must do so at an angle, bow first, creating a V-shape to the dock while waiting for the ice chunks to get pulled out with the changing water levels (hope I got that sorta right, Bill). We stopped on the bridge over Ship Creek, near the Alaska rail station (where the train from Fairbanks had just arrived). We saw hundreds of salmon, and the creek was lined with local fishermen, just out to catch some dinner, right there in downtown. After our tour we headed to dinner to Simon & Seafort’s, though the server informed us there were no such people by those names. I had some wonderful king crab cakes, while the other three dined on king salmon and quinoa. It was a wonderful, relaxing day. Our weather luck has continued to hold, though the wind picked up tonight so my hosts have predicted rain tomorrow. We awoke on Day 5 in Girdwood, at the base of Mt. Alyeska, a ski resort town. 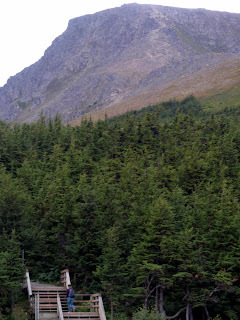 Alyeska is an old Aleut spelling for Alaska. Girdwood runs along the Seward Highway, and was forced to move inland after an earthquake in 1964 left the town below the high tide levels of the Cook Inlet. Gayle had friends living there at the time. They moved further inland, along with most other residents, thereby absorbing the Alyeska community into Girdwood. Gayle, Bill, Ryan and I had stayed in a really neat cabin in Girdwood for the night. In the morning, we checked out and drove over to The Bake Shop in town for breakfast. Naturally we ran into lots of people from last Saturday’s wedding, including the bride and groom. The Bake Shop has some of the best sourdough bread anywhere, and is where I had my first sourdough pancakes. From there Ryan and I said goodbye to Gayle and Bill, and set off to explore Alyeska. Of course (being married to a pilot) we had to start by driving over to the air strip, which is literally just a long strip of gravel in town. We pulled off the road to check out a stream and happened upon a group of roughly 10 salmon. We watched them with amazement as they struggled to swim upstream, against a strong downstream flow of water. They stayed mostly together, swimming a little, getting pushed back, resting along the side, and then pressing on. Quite a journey for fish who are simply going to lay eggs and then die, once they get there. 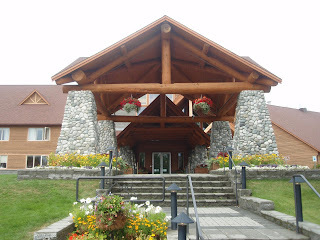 Next stop was the Hotel Alyeska, which is the starting point for the tram heading up the mountain. The tram carries skiers in the winter and hikers/sightseers in the summer. We opted to skip the tram and hike up the almost 4,000 foot mountain. That decision paid off nicely for us. Since I’ve been here I’ve been promised that moose wander randomly through town, and even in and out of Gayle’s yard, but I’d yet to see one. 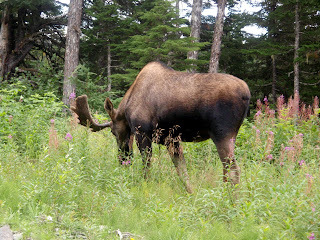 We weren’t 10 minutes into our hike when we encountered a couple large Bull Moose. They approached the trail from our right, as we backed up and gave them space. Ultimately, one crossed the road, we tired of waiting and decided to walk right in between them and continue our climb. They barely batted an eye at us, as we came within 25 feet or so of them. They are so massive, with big, broad antlers. The average adult moose stands almost 7 ft high at the shoulders, and can weigh as much as 1,500 pounds. 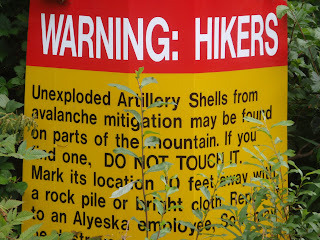 The hike was extremely steep at times, and we saw a sign warning us there may be live avalanche detonation devices along the way which we should not touch. Well, thank goodness they told me not to touch them! Who KNOWS what might have happened without that warning. The hike took us just under 2 hours, and, thanks to another fantastic weather day we were back in tank tops and sweating it out. 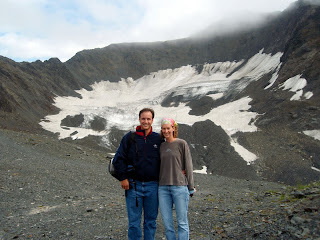 As we arrived at the top, we had amazing views of the Turnagain Arm (which I told you about here), the Glacier Bowl (the oh-so-creative name for the bowl-shaped glacier at the top of Alyeska), and all the surrounding mountains. 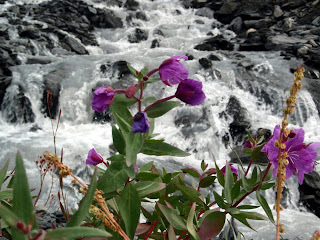 Much of the glacier is melting rapidly, creating a rushing waterfall running down the mountain. We stopped at the Glacier Express, a restaurant just below the top, where we enjoyed well-earned pints of Alaska Amber and White beer. The tram I mentioned earlier ends at the Glacier Express. We worked so hard on the way up we decided to take the tram back down. After two full days of challenging outdoor activities we started making our way back to Anchorage. Along the Seward Highway we stopped at Beluga Point, which is where the Boar Tides I mentioned here really gain their traction. 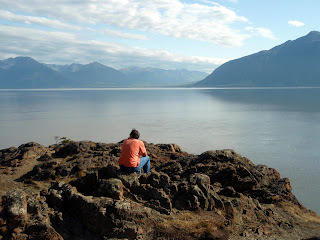 We did a little rock climbing out onto a giant rock where we had amazing views of the Turnagain Arm. 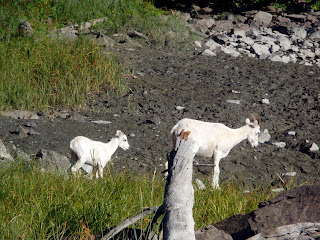 As we were leaving we noticed a couple of Dall Sheep across the road. Ryan walked out to within about 30 feet of them and waited with the camera. After a few minutes a baby Dall Sheep came hopping out of the brush and joined its papa for an afternoon snack in the grass. By the time we got back to Gayle’s she was in full swing vacuum sealing Halibut for our us to take home, and getting ready for dinner. She and Bill prepared a wonderful meal with some of the Halibut and Rock Fish we caught yesterday. We also dined on the Halibut cheeks, which some people will tell you is the best eating. The cheek is very different, in that it is more the firm consistency of steak, but flaky and perhaps a bit sweeter than the Halibut filet. I noticed you can buy them online for about $25/pound. Today’s Alaska update is brought to you as part of a mutual effort with all my new family, who just got off the fishing boat in Whittier. AK with me. 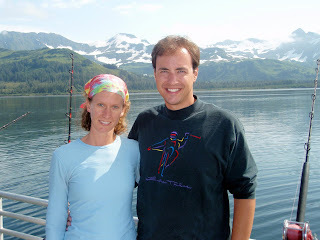 Plus, you are getting lots of facts thanks to my new cousin Brett Roth, a science teacher who clearly LOVES Alaska. He’s also pictured below in the orange/black jacket. We are all sitting in the parking lot in Whittier, because we just missed the tunnel opening by 2 minutes, so have to wait another 45 minutes before we can leave town. A word about the tunnel. Until about 10 years ago Whittier, a tiny military-turned-fishing village, was not accessible by car. There was a single lane train tunnel running from Portage, south to Whittier. The Anton Anderson Memorial Tunnel is the longest in North America. Thanks to Senator Ted Stevens, the tunnel was opened to automobile traffic in both directions. You can now drive into Whittier every hour, on the half hour, and out every hour, on the hour. 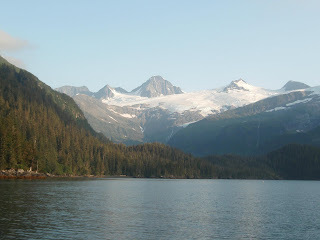 We drove to Whittier from Anchorage, and along Turnagain Arm, part of Cook Inlet. Turnagain Arm is so named because when Captain Cook first sailed into it, he was looking for the Northwest Passage. He kept commanding his men to “turnagain” as he got caught in the changing tides, and the name stuck. Speaking of changing tides, Turnagain Arm is home of the 2nd highest tidal fluctuations in the western hemisphere (the first is the Bay of Fundy in Nova Scotia). In fact, about once a month they have something called a Bore Tide – a phenomenon where the tide empties almost all the water out of the Arm and, as it returns later, it does so as one rolling wall of water that moves up with the tide. It’s a constantly breaking wave that, as it charges up the inlet, offers some recent crazy surfers and kayakers a unique opportunity to ride one, continuous wave for miles on end, as it refills the Arm. Here’s a great video clip of one charging up Turnagain Arm. According to Brett (who I think was quoting Wikipedia), 182 people live in Whittier. And they all live in the same building here in town. It’s one large condo-style building. The building is called Begich Towers – named after the father of the senator who succeeded Ted Stevens. So we arrived this morning, with enough folks to have two charter boats. Lots of folks are in town for (also new cousin) Monica’s wedding so family on both sides came out for fishing in Prince William Sound. 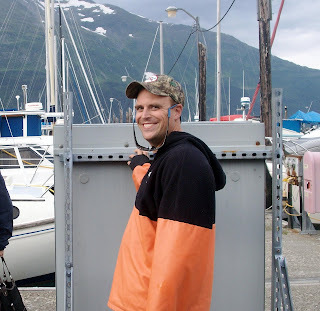 We went out on the “Offshore Hunter” with Jay, our captain from Whittier Alaska Fishing Charters. We set out around 7:30 a.m., amidst thick fog, though Brett had promised me: “This sh*t’ll burn off.” I think that’s Alaska speak for “It’s going to clear up.” Turns out he was right! Brett is no stranger to this area. He lives in Girdwood, just north of Whittier, and spends a lot of time fishing this area. He’s a high school science teacher and has taken this summer off and done a lot of fishing, camping and exploring. He’s one unique character, and a wealth of knowledge about local facts. He educated me throughout the day and is sitting behind me in the car now (because we made it back through the tunnel finally), steadily providing me a barrage of facts to share with you (don’t worry, I’m omitting the boring ones like – Prince William Sound was first explored by the British, blah blah). I was bundled up for the boat as if to take on the Arctic Circle, because Ryan and Gayle were both afraid of this southern gal freezing on the water. I literally had 6 layers on my upper body to start the day. Fortunately, the sun came out and I ended up peeling layers down to just my tank top for several hours. The day could not have been more perfect. It was just warm and sunny enough to make it completely pleasant. As we headed back to shore and the sun went behind clouds though, we bundled right back up! We fished today for Halibut and Salmon. 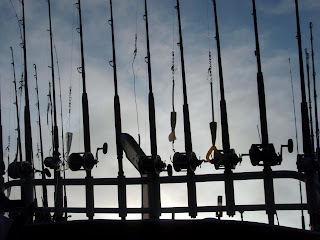 We didn’t catch a single Salmon but we caught lots of Halibut (24 of them, in fact). We also caught some Rock Fish and one giant Lingcod – about a 40 pounder. 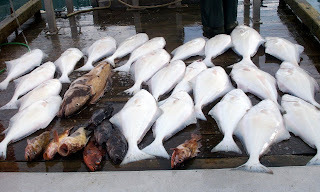 Together Ryan and I walked away with roughly 50 pounds of Halibut – do you KNOW what that would cost us in Knoxville?? Since Halibut is probably my favorite fish, I cannot wait to cook up and eat one that I managed to catch myself! And ABOUT fishing for Halibut – that is HARD WORK! First, the weights on our lines were 2 or 3 pounds. That may not sound like much but, try dropping it straight down 300 feet. Just reeling a fishless line in was work, so imagine fighting a 20 pound Halibut, that you have to wrangle the length of a football field! We’re staying in Girdwood tonight, hoping to hike Alyeska tomorrow and all I know is there’s a hot tub in our cabin and my arms are screaming for it. It’s almost 9 p.m. in Alaska and the sun is still shining brightly as we make our way to the cabin. My body is again reminding me it’s almost 1 a.m. my time and the family has mercifully opted for pizza in the cabin in lieu of dinner out. The day has been absolutely amazing. Boating in between glaciers and mountains, seeing Orcas, porpoises, even a humpback whale, and all the while getting to know these awesome folks who are now my family – an amazing day, indeed. I’m so excited to tell you all the things I’ve learned about Alaska today! Embarking on our 3rd day here in Alaska, my body is still revolting against adjusting to the time difference and change in latitude. But I’m persistent so I’m thinking she’ll come around here anytime. Fortunately we had a nice, slow morning – in great contrast to what I know is coming tomorrow. I always learn new things when I’m around Gayle. This morning I discovered Manuka Honey (Comvita Active Manuka Honey, 1.1 Pound Jars (Pack of 2) ), which is apparently great for ANYTHING that ails you. Manuka honey is from bees who feed on the flowers of the Manuka bush, also known as the “Tea Tree” to produce a honey that has anti-bacterial properties. Tea tree oil is commonly from the related Melaleuca tree native to Australia and is used as a topical antibiotic and antifungal for wounds that fail to close. Gayle, Bill, Ryan and I all decided to walk over to the Alaska Zoo this morning for “1/2 price Sunday.” The story about how the zoo started is worth sharing here. Rather than try to re-tell it though, let me share it through their own words. That’s right, some crazy Alaskan chose a baby elephant over $3,000 prize money. 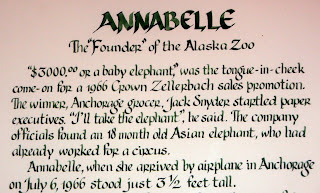 Annabelle, the first animal in the zoo, became quite the celebrity. You can still buy her “art” in town, as she became prolific with a paintbrush and easel. There are lots of other really cool animals in the Alaska Zoo, and it’s worth a visit if you’re up this way. Incidentally, I’ve been promised that Moose frequent Gayle’s yard but haven’t seen one yet. They do have a couple at the zoo though, so at least I got that. We returned to Gayle’s house where the maps came out and I got some geography lessons. First of all, did you know that you cannot drive TO Juneau, the capital of Alaska? You cannot drive there. You can drive once you get there, but you can only access it by air or by water. I had no idea. Next, we are right next door to Russia but you cannot, in fact, see it from your house here. Not even in Wasilla. We’re right on the edge of the Cook Inlet, and tomorrow we’ll be driving south, with the Turnagain Inlet on our right and mountains on our left. I don’t want to spoil tomorrow’s post by getting ahead of myself though, so I won’t say more now. Things have been abuzz here in Gayle’s house all afternoon, where we welcomed close to 60 family members tonight for spaghetti dinner. This woman is a machine, so of course all of the sauce was cooked on Thursday and carefully packaged and kept for today. She has made a dessert with rhubarb from her garden. Gayle also has “singing bowls,” each of which play the exact tone of the body chakras (CRYSTAL SINGING BOWLS – SET OF 7 QUALITY QUARTZ -NEW!! ). They get unbelievably loud and literally vibrate your soul. I’ve never experienced such. We’ve just concluded the extended family dinner. The Roth family is spectacular and I am exhausted. We have to be up at 4 a.m. in order to catch the 6:30 a.m. Whittier tunnel opening (more on that tomorrow), but for this reason I write no more and am turning in for the night. We crashed pretty hard last night, although my body woke up promptly at 7 a.m. Too bad that was eastern time so it was just 3 a.m. here! It was overcast in the morning, but that did not deter us from heading to the local farmer’s market Gayle (mom-in-law) recommended. One of the Twitter folks jokingly asked if that’s where they sold ice to eskimos. So I thought it worth snapping a few pictures to show that they not only grow it here, but they grow it big! I’ve never seen zucchini this big anywhere in my life. Then we did some shopping at the local REI, so I could stock up on my smart wool and long underwear, preparing for our upcoming activities planned for the week. From there, back to Gayle’s to get ready for Monica Roth’s wedding. Monica is one of MANY cousins I just married into, and attending this event was a little overwhelming, to say the least. My own family is fairly small, so marrying into and meeting members of my husband’s family, with somewhere around 9 direct aunts/uncles, not to mention spouses, first and second cousins, etc. it is a daunting task to try to meet and keep them all straight. Fantastic folks though, and it’s a pleasure to be here with them. Apparently I managed to select a dress for the wedding that was a favorite of the bride, because I pretty much matched the bridesmaids perfectly. No kidding, I couldn’t have matched them better if I’d tried. I keep hearing that the moose wander up and walk around in yards and through town, etc. I haven’t seen one yet, but I’m keeping my camera poised and ready for the moment this should happen. I can say with certainty that this place is far more green and comfortable than anyone in the southeast (who hasn’t been here) could imagine. Of course it is August, but still, flowers are blooming, veggies are growing, and yesterday I even sat on the deck with my shirt off and got a little suntan! Speaking of sun, it’s an interesting thing here. The sun doesn’t “set” as much as it circles us. It moves in an arc-like fashion around us, completely confusing me. I see the sun in the afternoon and assume it’s going down, like the sun does in the lower 48. Thirty minutes later the sun has changed positions, only now it’s due right of where I just saw it in the sky. I can’t count on the direction of the shadows, because they change in odd patterns, keeping my jet-lagged body disoriented to time of day. I never seem to sleep well when I know I have to be up early. This morning’s flight was not too early, but still required that I be up before 6 a.m. But of course, I was awake from about 4:00 a.m. I guess I’m always afraid I won’t wake up, even though I now have another person next to me, with his own alarm. It’s even more unlikely we’d both oversleep, but still I awaken early. This is the same fear I always had before a big road race, especially a marathon. I’d sleep a few hours, usually dreaming that I was late for the race and got lost on the course somewhere. Maybe it’s just that I don’t use an alarm most days, so I’m not sure I can trust it. As always though, we were up with plenty of time. Since we’re headed for my first trip to Alaska, Ryan’s home state, it is certain I over-packed. Not sure how cold it might really feel to me (in spite of everyone’s assurances that highs will be in the 60’s), and given that I rather enjoy the thermostat set at 79, I’ve thrown all my warmest clothing in a giant duffel bag. Granted, growing up on the coast means my warmest item is a rain jacket (this is what concerns me). Just to get myself ready, I spent the flight time listening to Jimmy Buffett, Bob Marley and some of Kenny Chesney’s island tunes, thinking nice, warm thoughts! Since the airlines now charge per bag we combined all our bulky items into one checked bag. Upon arrival at the airport we were proud to find the bag weighed in at exactly 49.0 lbs., just one pound below the weight at which they start assessing additional fees. We really love getting our money’s worth! Our first flight was through Minneapolis, about a 2 hour trip from Knoxville. After about an hour layover, we boarded for the 6 hour leg to Alaska. The only time I’ve ever spent 6 hours on a plane I ended up in another country where they spoke another language. It’s hard to imagine concluding 8 hours worth of flight time and STILL being in the United States. But here we are! 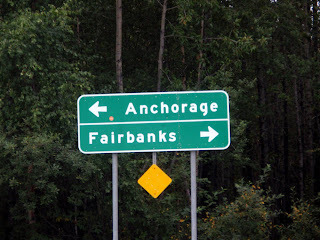 As Michelle Shocked would say – you know you’re in the largest state in the union when you’re anchored down in Anchorage. Due to a 4 hour time zone change we arrived before 3:00 p.m. (I’m writing this at 10:30 p.m. eastern time, but the sun is high in the sky here, only serving to confuse my weary body. It will be another 4 hours before sunset, and midnight before it really gets dark.) Leaving the airport we drove around Lake Hood, which is the largest and busiest sea plane base IN_THE_WORLD. We made a stop at the Lake Hood Inn, our friend Bill’s place. It’s an awesome spot, right on the water, where you can watch the steady flow of sea plane traffic. Since there is a Roth family wedding tomorrow, there’s a large BBQ this evening, with lots of extended family. It’s very exciting to be here in Anchorage and I’m looking forward to meeting the very large Roth family (now my family! ), most for the first time. Below are pictures of Bill’s place, the Inn.